This was our breakfast casserole on Christmas morning. I roasted some veggies which started to look a little less-than-fresh in the fridge: red pepper, sweet potato, carrots. I threw in some torn-up fresh spinach and scallions raw, added the egg mixture the night before and we had a very easy, pretty healthy, and super yummy breakfast (and lunch the next day). The sweet potatoes were a actually too sweet for me in the final product, but nothing a little hot sauce couldn’t cure! This recipe can be customized to use up whatever you have in the fridge or any veggie/meat combo you can dream up. You can take it latin with chilies and pork. Italian with tomatoes, mozzarella and basil. Broccoli/Cheddar. Spinach, Sun-dried tomato & red onion. I will be back next week to announce a fun fruit & veggie challenge for the new year. 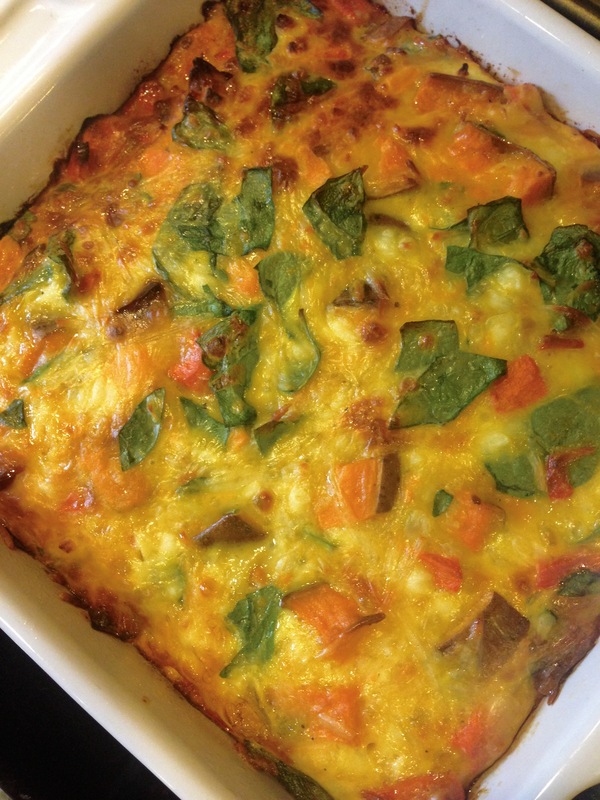 Until then, try this egg casserole with your favorite veggies and a side of fruit. Perfect for Sunday morning or New Year’s day. Grease 8×8 baking pan and preheat oven to 350°. Combine all ingredients with the beaten eggs in a medium bowl. Pour into the prepared dish and bake about 35 minutes until set. *Can also be made into “muffins” by filling each cup of a muffin tin 2/3 of the way. Egg muffins can stay in the refrigerator a couple days for quick morning breakfasts.